If you don’t do this one thing, you will lose all your edits when your lightroom catalog file gets corrupted. This is the one setting that I always turn on as soon as I install Adobe Photoshop Lightroom (LR) on any computer: Automatically Write Changes into XMP. Metadata Tab: Ensure that the third checkbox is ticked: “Automatically Write Changes into XMP“. Let Lightroom add .xmp files next to each of your photographs in your library. If that little intro wasn’t enough to convince you, I’ll explain. By default, Lightroom saves all your adjustments in its catalog file, located somewhere safe on your hard disk. It doesn’t edit your RAW files at all. That’s one of the beautiful things about the non-destructive RAW editing process. All your data is left intact. But it also means that if your Lightroom catalog file is corrupted, deleted or just lost in your backups and you can’t find the right one, then all the edits that you’ve done to your RAW files, the selections, the star ratings, they all disappear. XMP files come into use when you move your RAW files, or when you want to see the edits in a different application. In the past, Lightroom has crashed, leaving me with a corrupted .lrcat Catalog file, and many thousand files to re-edit. That’s not a situation I ever want to find myself in. Maybe you’re trying to free up space on your main work drive, or maybe you’re just backing up data, and somehow, your RAW files and the associated catalog files get disassociated. If those XMP files aren’t being saved next to your RAW files, then you may as well forget that you ever retouched / corrected those images because Lightroom will not be able to reference those changes when you open them up in their new location. When the tick box is on, all the changes and adjustments that you apply to each image in lightroom are saved to small .xmp files that have the same name as your original RAW files. Here’s what they look like in Windows Explorer. If this check box has been off until now, you may have noticed that changes that you make in Lightroom don’t show up in Adobe Camera Raw (ACR). However, once you turn it on, your edits will always be in sync between Adobe Camera Raw, Photoshop, Lightroom Classic CC, or even if you browse through files in Adobe Bridge. The process is seamless and you don’t have to think about it once it’s turned on. It feels like a magical moment when everything works seamlessly. The best part is that when you copy or move your RAW files (along with the new XMP files) you no longer have to worry about whether you need to save a new Lightroom Catalog file for that particular folder. Your edits will move along with your RAW files in the form of the .XMP sidecar files. They’ll always be available to applications that can read the sidecar files, and will always be updated when you make edits to the picture, automatically syncing across Adobe apps. Isn’t that convenient? 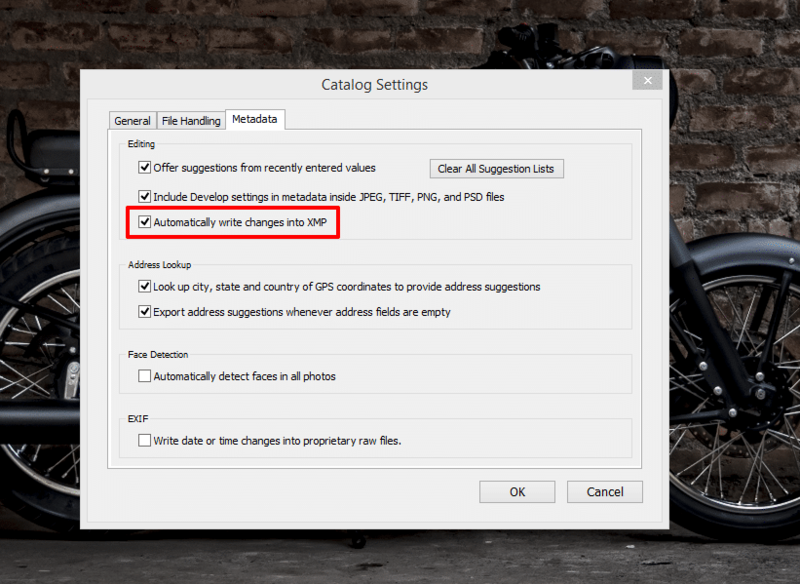 You also don’t have to worry about corrupted Lightroom Catalog files anymore. You’ll essentially have a backup of your catalog split across each folder that you save your RAW files in. If you’re working with a retoucher, this comes in handy. You can send them your RAW files to edit. Once all the work is done in Lightroom, all they have to do is send you the .xmp files. This is a fast and efficient way to work with retouching houses who work remotely. The .xmp files are quite small, so file storage and transmission is easy. There you have it! A simple settings change in Adobe Lightroom Classic CC, that can dramatically change the way you work, and the safety of your edits. It can also keep your work safe from the spectre of database corruption. Do you have any thoughts to add to this? Please leave a comment below if you do! I’ve been going back through some of these posts and this is something I never knew about. Lightroom has caused issues with crashing and stalling in the past (maybe because I’m running it on an ancient iMac), and there’s nothing worse than that initial panic when it freezes up! Weird that such an important setting is turned off by default. I assume that if you want to send a photo to someone, you can just send both the RAW file and the XMP sidecar—if they open the RAW, will it automatically open both of them? Another good option is to use a DNG. You need to remember to regularly update the metadata, but it saves all that XMP info directly within the file rather than in a sidecar. Pretty nifty if you want to keep everything in one package! Are there any other Applications such as Apple Photo or Google Photo that can read this data? I don’t think so. But I may be wrong. I don’t use Apple Photos so I don’t know if it can… Google Photos sure can’t do that. However, if you export as a .DNG and then import it to them I think it should work. Prior to this setting being turned on, the metadata has not been being saved then, so do I need to go back into each catalog to select all of the files and tell it to save manually? And if the file is just a jpeg the metadata gets saved within the same jpeg file? I’m not actually sure what happens with JPG files. I never use them. Will edit the article appropriately when I get the chance.